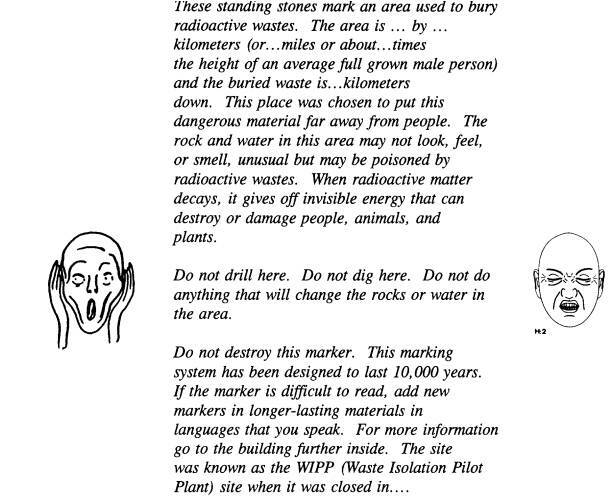 In the early 1990s the United States Department for Energy commissioned a report on the best way to keep future generations out of nuclear waste storage sites. 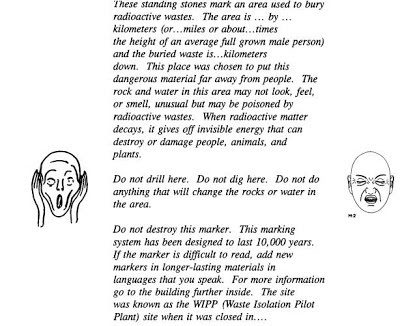 The result, Expert Judgment on Markers to Deter Inadvertent Human Intrusion into the Waste Isolation Pilot Plant, is a completely fascinating document, which draws on anthropology, semiotics, linguistics, astronomy, architectural theory, geology, material science, and sui generis analysis and speculation, and is by turns terrifying, brilliant, deranged, stupid, lyrical, hilarious, and incredibly dull. 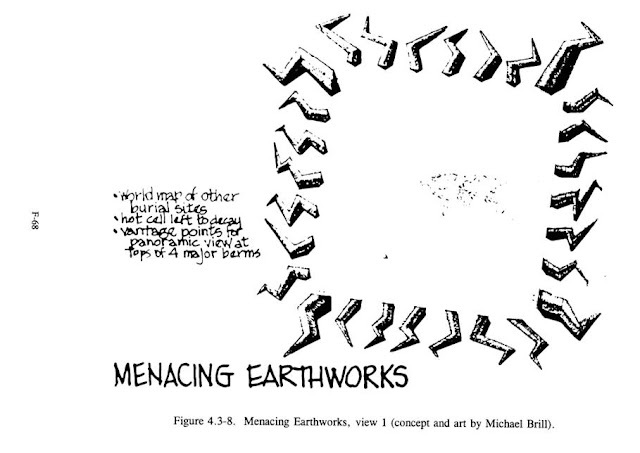 “Menacing Earthworks” (Figs. 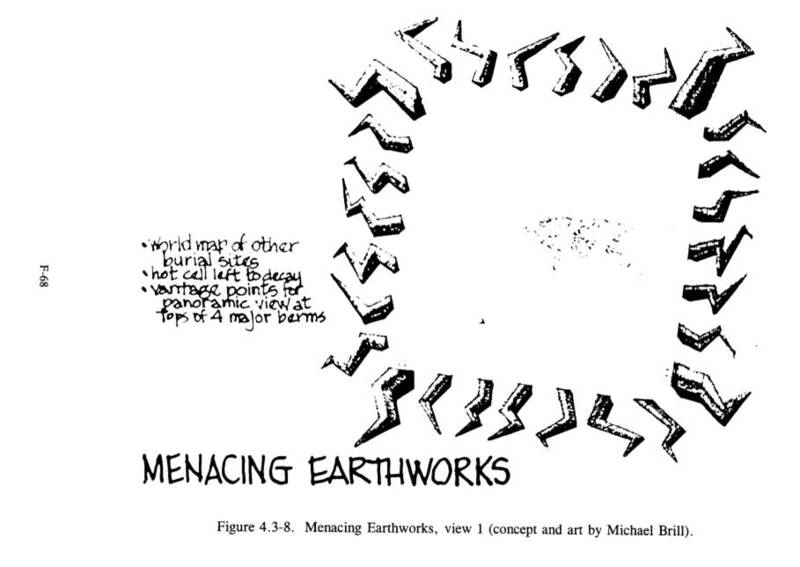 4.3-8, 4.3-9): Immense lightning-shaped earthworks radiating out of an open-centered Keep. It is very powerful when seen both from the air and from the vantage points on the tops of the four highest earthworks, the ones just off the corners of the square Keep. Walking through it, at ground level, the massive earthworks crowd in on you, dwarfing you, cutting off your sight to the horizon, a loss of connection to any sense of place." Just one of the baffling issues the report wrestles with is the possibility that any marker whatsoever may attract archaeological attention. "For human beginnings, making a center (‘here we are’) is the first act of marking order (Cosmos) out of undifferentiation (Chaos)." Explorers entered the Great Pyramid at Giza, against its designers' intentions, before understanding its hieroglyphics. The Great Pyramid is less that 5,000 years young; the Department of Energy were looking at a timescale of 10,000 years. In fact, that's just what they needed for regulatory approval: some of the waste will remain hazardous for even longer. I wonder how well the proposals of the 1990s hold up now after only about twenty? The specific site in question is the Waste Isolation Pilot Plant in New Mexico. According to Science Illustrated by way of Wikipedia, the final plans for the marker system won't be submitted till 2028. It makes sense to take time over this. Already the "DIG HERE . . . NOT!" altarpiece looks dated. I haven't yet noticed any mentions of the first two things which sprung to my mind, which were: (1) stop making nuclear waste; (2) bladed pendulum traps. The advantage of a perimeter of bladed pendulum traps is that at least you may get someone putting up a fresh sign saying "WARNING! BLADED PENDULUM TRAPS" every thousand years or so. 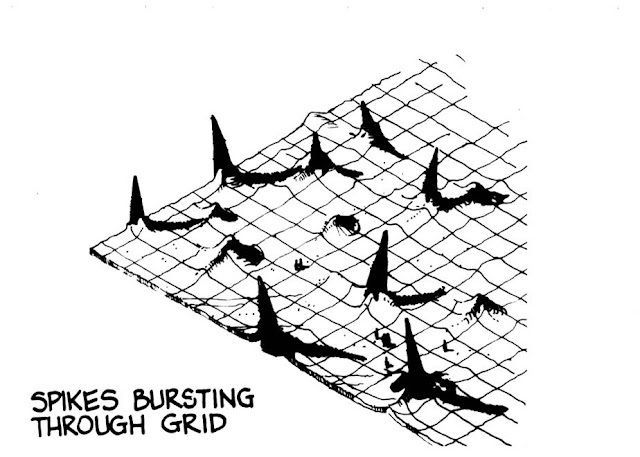 The possibility of a dynamic, evolving marker system is considered to some extent. For instance, the proposed messages ask that they be re-engraved again if they are difficult to read. An enterprising tagger could enter the facility and translate them into Tolkien's Black Speech on the blank granite provided. Were they to do so I would mention them on my blog. Look ye also: monuments, memorials and dark tourism; Kathleen M. Trauth et al., "Effectiveness of Passive Institutional Controls in Reducing Inadvertent Human Intrusion into the Waste Isolation Pilot Plant for Use in Performance Assessments"; Gregory Benford's Deep Time; Japan flipflopping on nuke dump spot; Cumbria's p'raps not thanks all the same; the Mafia option.